Since the 21st century began, the value of gold has soared and gold buying has maintained historic levels. 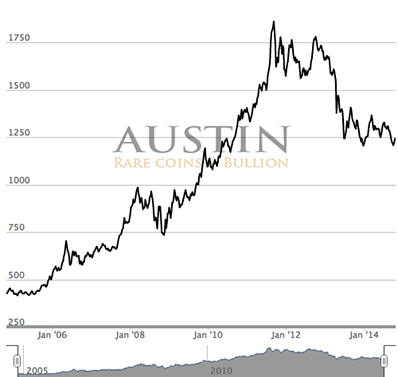 Investors worldwide have clamored for the yellow metals driving up the value of gold for a low of $258 an ounce in 2001 to peak at $1,910 in August of 2011. The value of gold has amazingly multiplied 7 fold from valley to peak! U.S. Stocks and bonds have not begun to match those returns in the 21st century. Despite the current correction in the gold market, the value of gold is down only 30% from the peak, a very typical market correction. In fact, during the 1970’s bull market, the value of gold fell by 50%, and then gold went on to hit record highs. 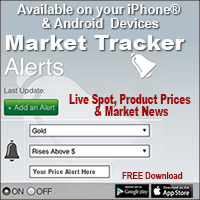 We’re looking for gold prices to turn around in 2015. We continue to feel that gold is a bargain today and the value of gold as investor insurance cannot be overstated. The circumstances for a bull market in gold have never been better since gold traded at $258 an ounce. The U.S. economy is still afloat but at the cost of long-term debt that Washington seems unwilling to get under control. In the face of these questions and the falling value of gold, the U.S. Mint continued to sell gold at record levels. China has admitted to purchasing a quantity of gold equal to all the newly mined gold in the world. Gold acts as a safe harbor against economic, political, or social crisis including times of war, when the government is acting irrationally, and when fear of currency devaluations rise. In a fiat paper currency crisis like we see developing, the value of gold will rise automatically as the local currency declines in buying power. While gold is in a correction against the U.S. Dollar today, it’s trading at record highs against other nation’s falling currency. As a currency crisis develops, as it has in the Greece and Cyprus debt crisis, the fear of paper drives up the price of gold before the public knows what has happened. Debt destroys the currency and benefits the value of gold. As the U.S. national debt surpassed $17.5 Trillion Dollars. Sadly, there’s no political will in Washington to stop spending. As long as the rest of the world is willing to loan us money and the Federal Reserve continues to print $85 Billion Dollars a month, the economy continues to stay afloat. Investor’s worse fear is that hyperinflation will hit in 2015 and play catch-up for all the abuse the Federal Reserve and Washington have done to the monetary system since the 2008 mortgage debt crisis. Gold protects against stock market crashes and bond meltdowns. When stocks, bonds, paper assets, and IOUs become suspect or fall in value rapidly, investors flee to gold. The recent City of Detroit bankruptcy was a precursor to what many believe will be a failure of the U.S. government to pay interest on borrowed money or repay Treasury Bills. In the worst case condition, the value of gold has no upward limits as other nations flee the U.S. Dollar and our currency falls toward ZERO value. Warning: The gold market is subject to speculation as are other markets, especially through the use of futures contracts, derivatives, and ETFs. Short covering can turn around corrections quickly. No other substance on Earth embodies the unique characteristics of gold. Its yellow luster and beauty are unsurpassed. Since the early days of mankind, it’s been admired, molded, shaped, and worn as a symbol of wealth and good taste. This continues throughout the world today. Throughout history, every paper currency has become totally worthless over time; yet gold remains. The romance and lure of gold is enhanced by its historic use as a storehouse of wealth. Gold's value is intrinsic. Its value is a measure of the true wealth and the stability of national currencies the world over. The precious metal gold cannot be created or destroyed or altered. It forever remains one of the most liquid investments worldwide boundaries. Gold is bought, sold, traded, and stored in most parts of the free world with complete privacy. Likewise, U.S. gold coins enjoy many of these unique advantages. Acquiring U.S. gold coins put you in great company throughout American history. Prior to 1933, all U.S. paper currency was backed by gold reserves held by the nation’s banks. 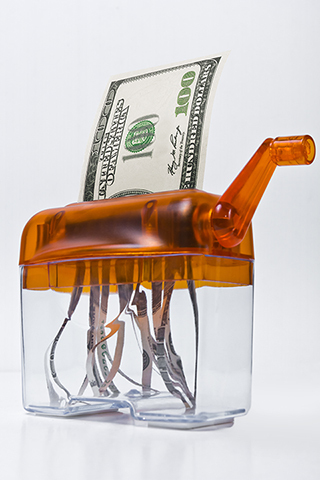 Today, paper dollars are backed only by a government promise, nothing more. 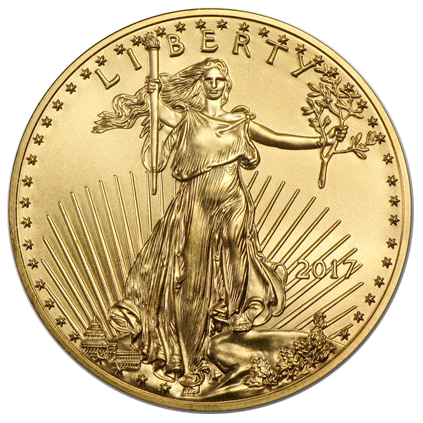 For investors who value gold, they recognize the safety, privacy and instant liquidity of U.S. gold coins. As official legal tender, each coin has a government guaranteed weight and gold content. 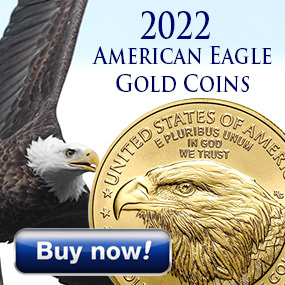 American Eagles and American Buffalo gold coins have unquestioned quality being issued by the U.S. Mint.